Den Bohnen ist das Suffix in der Rechtschreib-Suppe untergegangen. So kommt es, dass heute nur ein Bohneintopf anstelle eines Bohneneintops auf der Karte stehen kann. tun wir hier ja gerne grinsen. 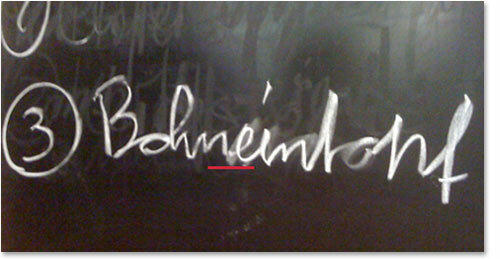 Hmmm … bist du sicher, dass der Schreiber dort auf der Tafel nicht “Bohneintonf” geschrieben hat? 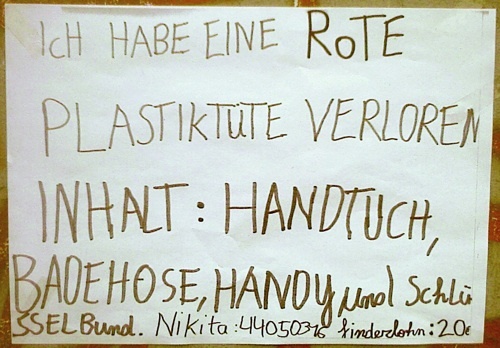 ‘Ne richtige Unterlänge hat der Buchstabe ja nicht grade. I tend to very much disagree with what was said but in hindsight I don’t follow the subject enough. You might have a much better grasp than I.
obviously like your website however you have to test the spelling on quite a few of your posts. A number of them are rife with spelling problems and I find it very bothersome to tell the reality on the other hand I will surely come back again. You need to be good at negotiating, too. Use this article to help you become an expert . Different manufacturers have versions with distinctive characteristics. May I simply just say what a relief to discover an individual who truly knows what they’re discussing over the internet. You certainly understand how to bring a problem to light and make it important. More and more people ought to check this out and understand this side of the story. I was surprised that you are not more popular since you certainly have the gift. Can I just say what a relief to find someone who truly knows what theyre speaking about on the internet. You undoubtedly know tips on how to deliver an issue to mild and make it important. More folks must read this and perceive this aspect of the story. I cant believe youre not more standard since you undoubtedly have the gift. à parcourir pour arriver aux vaisseaux sans avoir chaviré. we’re a group of volunteers and starting a brand new scheme in our community. your web site provided us with helpful info to paintings on. you have performed an impressive process and our whole community will probably be grateful to you.